TICKETS GO ON SALE IN 3...2...1...NOW! The Santa Scavenger Hunt is back! We can already hear your screams of excitement as we announced it. It’s time to get your Santa outfits out of the attic and check they still fit, because you are going to want to take part in this year’s Santa Scavenger Hunt! With new challenges and new location’s, you can guarantee the chaos to return in full force, and if your Christmas’ are anything like mine then a bit of chaos will feel exactly like Christmas day! To take part in this year’s hunt all you need is yourself and 4 other friends, colleagues, family members even strangers if you fancied it to make a team! But you must hurry as there are only 12 spaces available on each day and trust me they are selling out fast. We don’t want you to miss out so click on the link below and get ready as tickets are only £20.00 per person (£100 for each team) they are a Christmas steal and you simply can’t argue with that. 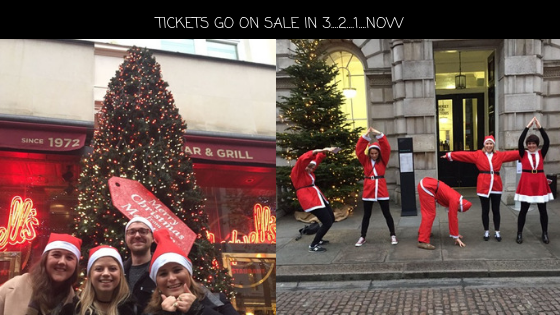 So, whether you prefer to sing Christmas carols or stuff your face with pigs in blanket our Santa Scavenger Hunts suits all, it will make your December one to remember so, get your tickets before they sell out in 3…2…1…GONE!